#Mainagate: AGF Malami, Head of Service & Minister of Interior denies reinstating wanted ex-pension boss, Abdulrasheed Maina, into the civil service – Royal Times of Nigeria. 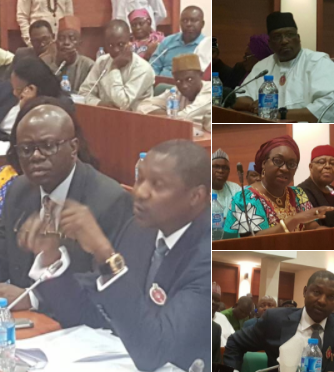 At a public hearing at the House of Representatives yesterday, Minister of Justice and Attorney General of the Federation, Abubakar Malami, Head of Service Winifred Oyo-Ita and Minister of Interior Affairs, Abdulrahman Dambazzau, all denied ordering the reinstatement of fugitive former chairman of the Presidential Taskforce on Pension Reforms, Abdulrasheed Maina. Minister of Justice and Attorney General of the Federation, Abubakar Malami told the lawmakers investigating Maina’s controversial reinstatement that the letter for Maina’s reinstatement was not issued by him as the reinstatement of Maina was still in progress before the letter was released to him. Malami who told the Senate last week that he met with Maina in Dubai sometime last year, told the House panel that Maina gave useful information on pension fraud to his office which was shared with security agencies and this has led to the discovery of billions of looted pension funds and physical assets. The Head of Service giving her own statement said that she decided to hold on to the letter for Maina’s recall because she believed that reinstating such a man would have a negative impact on the anti-corruption fight of the Buhari-led administration. She said, “I decided to hold on to the letter and without giving an order for reinstatement, the Ministry of Interior decided to reinstate him which we got to hear in the media. I still have the originals of the letters with me, and there was no time I issued any order for Maina’s reinstatement. And normally, there is no civil servant that can be reinstated without the express directive of the Head of Service “. The Interior Minister, Abdulrahman Danbazzau denied having any role in the reinstatement of Maina whose office is under his Ministry. He stated, “My role as minister was on a policy matter that has to do with public safety and internal security and also chair anything that has to do with board that establishes prison, Immigration civil defense and Federal fire service”. ‎However, the Permanent Secretary in the Ministry of Interior, Engineer Magaji who allegedly carried out the said reinstatement of Maina was nowhere to be seen at the hearing. Danbazzau told the panel that Magaji went on a sick leave and will be back soon. The acting Chairman of the Federal Civil Service Commission, Joseph Oluremi told the panel that the office of the Attorney General of the Federation initiated the letter and that it was subsequently acted upon by the Ministry of Interior and made the recommendation of his reinstatement. Oluremi said, “The delivery of the letter is the duty of the Head of Service and if the letter has not been delivered it means Maina has not been reinstated. That is the only letter Maina will take to the Head of Service and the HoS will process it. “It is either to post him back to the ministry of interior or to another ministry. For the Ministry of interior to use that letter informing them as letter of reinstatement is wrong”. Also speaking at the hearing the representative of Inspector General of Police, DIG Valentine Toochukwu denied the involvement of Nigeria police providing security protection for Maina adding that they don’t know anything about his disappearance and reappearance and promotion. The chairman of the committee, Hon. Aliu Madaki Sani adjourned the proceedings until November 30th and asked the permanent secretary of the Ministry of Interior to appear before it unfailingly.